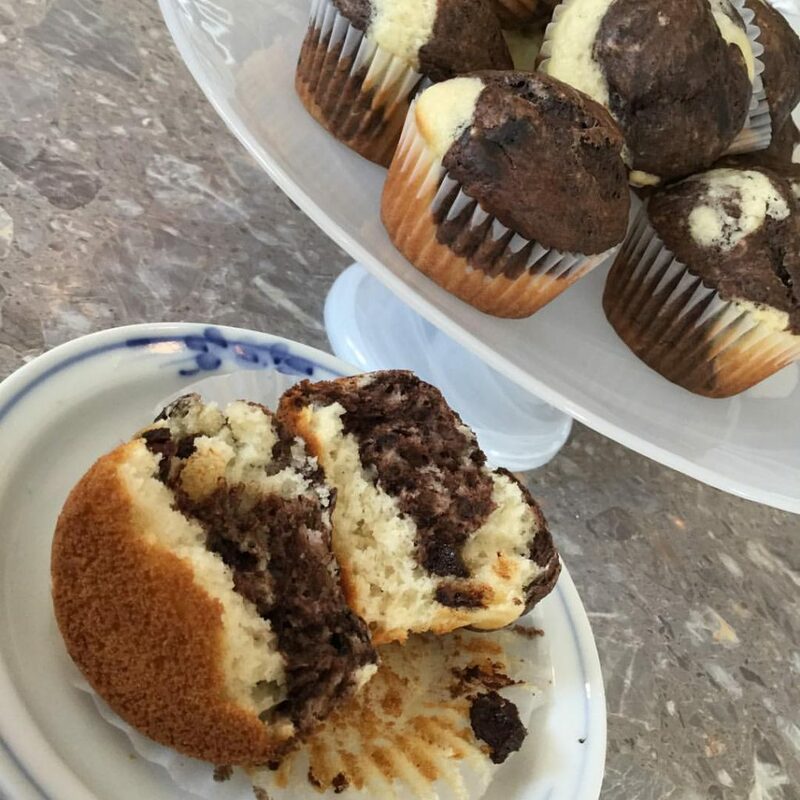 I started making this recipe about 19 years ago but then I stopped working at the school where I was making about 6 dozen of these a week, my own children grew up and left home and I no longer felt the need to make chocolate muffins. Now I am back at that same school and find myself making these again! Line 24 muffin cups with paper liners or lightly spray with Pam. In large mixing bowl whisk together flour, baking powder, salt, cinnamon, sugar and cocoa; make a well in the centre and set aside. In large mixing cup combine liquid ingredients. Pour liquid ingredients into well in dry ingredients and stir just until combined. Bake in 400F oven for 20 minutes. Remove from oven to wire rack and cool for 10 minutes in the pan. Turn out onto wire rack and cool completely. The class I work in at school went to the pumpkin patch before Halloween. I asked the students what they do with their pumpkins once Halloween is over? They all basically shrugged their shoulders, gave me a weird look and said they threw them away, or whatever. Enter story about how you can peel, cut up and cook the pumpkin and turn it into something yummy. Again, the weird looks. Next Question: Who likes pumpkin pie?All their hands shot up into the air. “Well, where do you think the pumpkin comes from?” Realization sinks in. In honour of our trip to the pumpkin patch and their new found knowledge that you can cook with pumpkin I have been baking up pumpkin-inspired treats for them. Line baking trays with parchment paper or lightly spray with vegetable oil spray and dust lightly with cornmeal. In Kitchenaid mixing bowl combine flour, sugar, baking powder, salt, cinnamon, nutmeg, cloves and ginger; stir, on lowest setting for about 1 minute. While that is stirring, combine pumpkin, cream and eggs in a large measuring cup. Pour in pumpkin mixture and stir just until dough pulls away from the sides of the bowl. Turn the sticky dough out onto a floured surface and gently knead about 10 times. 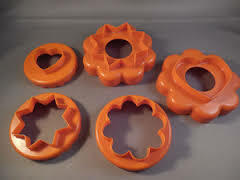 GENTLY roll out dough to about 3/4 inch (2 cm) thickness and cut with floured biscuit cutter. Place close, but not touching, together on prepared baking sheets. Bake for 14 – 16 minutes in 425F oven, until lightly golden browned. While scones are baking, lay down two strips of wax paper, plastic wrap and place cooling racks onto it; this will make your clean up so much easier when you do the final two steps. Remove from oven, transfer scones to wire rack to cool. While scones are cooling (about 15 minutes) in small bowl combine first amount of icing sugar, vanilla and milk, stirring until smooth. 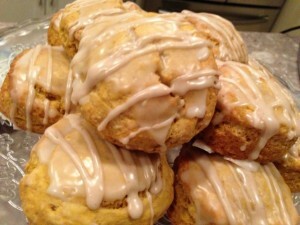 Use a pastry brush to brush a layer of glaze onto each scone. In a small bowl combine icing sugar, cinnamon, nutmeg, cloves and ginger. Load the thick glaze into a piping bag or a sandwich bag with a corner snipped off. Pipe lines of thick glaze over the first layer of glaze. 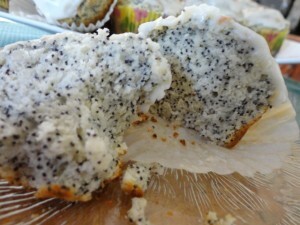 I love Lemon Poppyseed Muffins. I don’t make them nearly often enough! The problem with making them is that I then have to eat them all…I love the citrus taste of these along with the subtle CrUnCh from the poppyseeds. Alright, truth be told? It is the Lemon Glaze that keeps me coming back for more! Combine milk and poppyseeds in a large liquid measuring cup and let stand for 10 minutes. In large mixing bowl combine flour, baking powder, salt and lemon zest; make a well in the centre and set aside. In mixing bowl cream together butter and sugar; add egg and continue creaming until light and fluffy. Add vanilla and lemon juice to poppyseed liquid before stirring into the creamed mixture. Pour wet ingredients into the well in the dry ingredients and stir only to moisten. 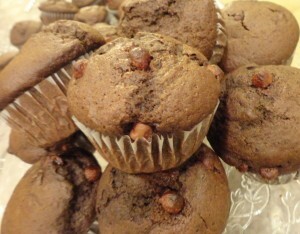 Using a #5 Pampered Chef Scoop, fill each muffin cup 3/4 full. Bake in 400F oven for 20 to 25 minutes, or until pick inserted comes out clean, rotating pan halfway through baking. Remove from oven and cool on wire rack for 10 minutes before turning out to cool completely. While muffins are cooling, make the Lemon Glaze. In medium mixing bowl combine icing sugar, lemon juice and vanilla; stir. Add enough milk to your desired consistency…go slow here…easier to add a lil milk than to add more icing sugar! Spread Glaze over cooling Muffins and let cool completely allowing the Glaze to set before storing in an airtight container. 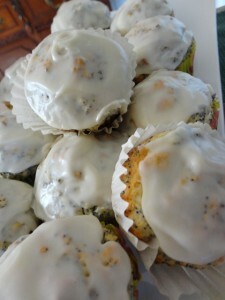 Lemon Poppyseed Muffins with Lemon Glaze - oh, so good!